View from the terrace at New York Yacht Club's Harbor Court. Sail back down to the splendor of Newport , one of the world’s great yachting destinations. Newport is always hopping. One weekend you might have a classic wooden yachts regatta, the next weekend the highest end, most technologically advanced mega-yachts arrive from a casual jaunt across the Atlantic to see who can go it just a tiny bit faster this week. Naturally, the golden era of yachting when the mansions along Cliff Walk provided a bird's eye view of the entire series of America's Cup Challenges has left its imprint. There is still a sense of grandeur, tradition, exquisite style, and opulence, which on occasion translates into what some might call "class". But today, one might attend a mystery theater evening at one of the mansions rather than an exclusively private social gathering. We like the Newport of today. When New York Yacht Club (NYYC) failed to keep the America's Cup (and we'd venture to say that was a good thing for the sport), Newport seemed to go through a period of uncertainty about its future. More recently, the residents and leaders have realized that it's not a one event town and that sailing in all its forms can certainly preserve its character while enriching its future. So a new heritage is forming and it feels downright vibrant. 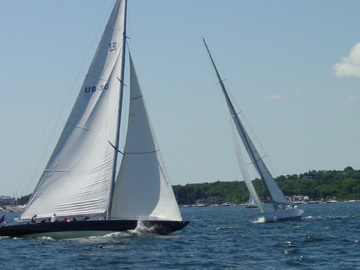 Major yachting events are being staged by all the facilities working in unison, with the Yacht Restoration School, Fort Adams and the Museum of Yachting, NYYC, Ida Lewis YC, Newport Yacht Club, and the marinas and shipyards at the epicenter. And the leadership is really working hard to get people into town and to get more people - especially young people - out sailing. Bravo! Newport Harbor is one of the most entertaining, interesting, beautiful and best recreational harbors in the world. 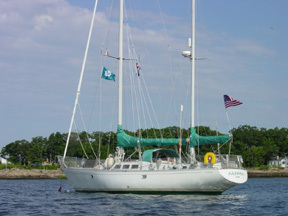 Newport is considered by many to be the sailing capital of the world. 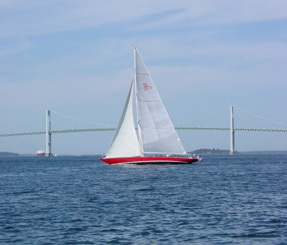 With its refreshing ocean breezes, beautiful coastline and stunning sights, Newport offers an unparalleled sailing experience. Newport is a natural harbor that doesn't really have a parallel. Deep water, easy access to the Atlantic, a plethora of services and facilities, exquisite protection from the elements, and a great little town to support it make Newport unique among ports of call. Add to that a heavy emphasis on sailing, and voila you have a sailing mecca. It draws sailors in from the sea for a day, a week, or a long spell. Viva Newport. Your day has come again. Epicurean delights abound. Try the Spiced Pear restaurant for an amazing setting with dramatic oceanfront views and excellent culinary creations. The 120-seat restaurant offers outdoor dining for breakfast, lunch and dinner on its covered terrace overlooking the manicured garden, ocean and Easton’s Beach as well as indoor dining in the veranda room and main dining room. The Spiced Pear Restaurant is located within Newport’s exquisite waterfront hotel, the Chanler at Cliff Walk. I still always gravitate to the Black Pearl, the Mooring or the Red Parrot for lunch and the Candy Store for a casual dinner. I just love the ambiance at the Candy Store. Always vibrant! Scales and Shells is a terrific fish restaurant down on Thames, and the Newport Blues Cafe sounds terrific but we haven't had a chance to sample it yet. Of course, the most spectacular location in Newport has to be the New York Yacht Club’s although they do not offer reciprocal privileges to members of other clubs.